NIST has developed an organizational policy on traceability and a set of related supplementary materials, which includes answers to questions frequently asked by customers of NIST measurement services. The policy and supplementary materials are intended to serve as a resource for NIST customers. It is important to note that traceability is the property of the result of a measurement, not of an instrument or calibration report or laboratory. It is not achieved by following any one particular procedure or using special equipment. Merely having an instrument calibrated, even by NIST, is not enough to make the measurement result obtained from that instrument traceable to realizations of the appropriate SI unit or other specified references. The measurement system by which values and uncertainties are transferred must be clearly understood and under control. I.A.2 Is it correct to say that measurements or standards are traceable? Only measurement results are traceable. I.A.3 Is it correct to say that an organization is traceable? Organizations cannot be traceable. Only measurement results can be traceable. I.A.4 Who is responsible for supporting claims of traceability? The provider of the result of a measurement is responsible for supporting its claim of the traceability of that result or value. This is the case whether that provider is NIST or another organization. I.A.5 What do I need to do to support a claim of traceability? An internal measurement assurance program may be quite simple or very complex, the level or rigor to be determined depending on the level of uncertainty at issue and what is needed to demonstrate its credibility. Users of a measurement result are responsible for determining what is adequate to meet their needs. For information and guidance on expressing measurement uncertainty, see http://physics.nist.gov/cuu/. See Section V Checklist for Traceability through Calibration for additional guidance. I.A.6 Who is responsible for assessing the validity of claims of traceability? The user of the result of a measurement is responsible for assessing the validity of a claim of traceability. However, as discussed in Question I.A.4 above, the provider is responsible for providing the necessary information that the user assesses. I.A.7 What should I look for in a valid claim of traceability? See Question I.A.5 above, which provides information on what the provider of a measurement result should do to support a claim of traceability. As a user, you should look for these elements. See Section V Checklist for Traceability through Calibration for additional guidance. I.B.1 What is involved in establishing metrological traceability? an 'internal measurement assurance' program for establishing the status of the specified reference at the time that the measurement system or working standard was calibrated against it. An internal measurement assurance program may be quite simple or very complex, the level or rigor to be determined depending on the level of uncertainty at issue and what is needed to demonstrate its credibility.Users of a measurement result are responsible for determining what is adequate to meet their needs. I.B.2 Who is responsible for establishing the traceability of measurement results? The provider of the result of a measurement is responsible for establishing the traceability of this result. This is the case whether that provider is NIST or another organization. I.B.3 Does metrological traceability need to be reexamined periodically? What are the criteria for judging the integrity of the metrological traceability chain? Yes, traceability does need to be reexamined periodically, and the criteria for assessing the integrity of the traceability chain are dependent on many things. To be considered are: the measurement requirements, the needs of the client, the dependability of the equipment and standards, the environmental effects, etc. For more details, see Reference . I.B.4 Is a NIST Test Report Number necessary and/or sufficient evidence of traceability? Test report numbers issued by NIST are intended to be used solely for administrative purposes. Although they are often used to uniquely identify documents which bear evidence of traceability, test report numbers themselves do not address the issues listed in I.B.1 above, and should not be used nor required as the sole proof of traceability. I.B.5 To establish the traceability of a measurement result for a particular measurand, is it also necessary to establish the traceability of all other values of measured quantities associated with the measurand, especially those that might contribute in a relatively minor way? For example, when making a dimensional measurement, do the measurements of barometric pressure, humidity, and temperature for a dimensional measurement need to be traceable to the International System of Units (SI)? As a general principle, the definition of metrological traceability in the VIM suggests that it is necessary to establish the traceability of all associated input quantities in a measurement model. A measurement model defines the way in which a measurement result depends upon an associated input quantity. For example, a dimensional measurement result may depend upon barometric pressure, humidity, and temperature, if the value of, and/or the variation in these quantities contributes significantly to the value or stated uncertainty of the measurement result. As a practical matter, the contribution of an input quantity to a measurement result is significant if a change in the value or uncertainty of the input quantity corresponds to a change in the significant figures of the stated value or uncertainty of the measurement result. When this is the case, traceability for the measurement of the associated input quantity should be established. The required levels of uncertainty that must be achieved for these associated input quantities may be relatively large, depending on the degree to which the input quantity actually affects the value or the stated uncertainty of the measurement result. I.C.2 What is NIST's role in metrological traceability? last, to collaborate on development of standard definitions, interpretations, and recommended practices with organizations that have authority and responsibility for variously defining, specifying, assuring, or certifying traceability. I.C.3 What is meant by the phrase "traceable to NIST"? According to the internationally recognized VIM definition, metrological traceability is a property of a measurement result by which that result is related to specified reference standards, not to institutions. Accordingly, the phrase "traceable to NIST", in its most proper sense, is shorthand for "metrologically traceable to NIST's practical realization of the definition of a measurement unit" (see 2.43 in Reference ). I.C.4 I want my measurement results to be traceable to NIST. What do I have to do? To achieve traceability of measurement results to standards maintained by NIST, you need to reference your measurement results through an unbroken chain of calibrations, including determining the uncertainties at each step, to NIST standards as the specified references. These references may be, for example, standards developed and maintained by NIST: broadcast signals controlled or monitored by NIST (such as standard time and frequency signals), NIST Standard Reference Materials (SRMs), or NIST-Traceable Reference Materials (NTRMs). The chain of calibrations may be short, if the user has instruments or artifacts calibrated by NIST or acquires standards from NIST and references measurement results to those. It may be longer, if the user references other calibrations in a chain of calibrations back to stated references developed and maintained by NIST. Also see Question I.A.5 above and Section V Checklist for Traceability through Calibration for additional guidance. I.C.5 How does NIST establish the traceability of its own measurement results? In general, NIST establishes the traceability of its own measurement results by following the prescription of the VIM definition of traceability, that is, through an unbroken chain of calibrations, including determining the uncertainties at each step, to specified references. In the case of the SI units, for six of the seven base units the ultimate stated reference is a CIPM-established definition of the units, including associated procedures; for one SI unit, mass, the reference is specified as the international prototype kilogram. The same process also applies in the case of derived units, which are formed as products of powers of the base units according to the algebraic relations linking the quantities concerned. For other measurement quantities, the reference may be a national standard defined de facto by a conventionally stated method. I.C.6 How does NIST support its own claims of traceability? NIST documents the process by which it establishes traceability of its own measurement results as part of the NIST System for Assuring Quality in the Results of Measurements Delivered to Customers in Calibration and Measurement Certificates. In accordance with the System, NIST maintains current technical descriptions of (a) the measurement facility, system, or methods; (b) the procedures for conduct of the measurement(s); (c) the analysis of uncertainty of the measurement results; and (d) the procedures for statistical control of the measurement process. This documentation includes a description of how traceability is/was achieved. I.C.7 Does NIST certify the traceability of its own measurement results? According to the NIST policy on traceability, NIST establishes the traceability of the results of its own measurements and of results provided to customers in NIST calibration and measurement certificates and, if not always explicitly then always by clear implication, certifies that traceability. Although the measurement results in a calibration or measurement certificate can be considered to be 'certified' by NIST to be traceable to NIST reference standards at the time the measurements were performed, NIST cannot 'certify' that those measurement results are valid after an instrument has left NIST. In the case of Standard Reference Materials, each certificate specifies the conditions under which NIST stands behind its measurement results after the SRM has left NIST. The customer must have an appropriate internal measurement assurance program in place to assure the continued validity of those measurement results. See Reference . I.C.8 Does NIST certify the traceability of measurement results other than its own? I.C.9 Given that NIST operates the National Voluntary Laboratory Accreditation Program (NVLAP), does this mean that NIST stands behind claims of traceability made by NVLAP-accredited labs? No, laboratory accreditation, whether conducted by NIST/NVLAP or any other recognized accreditation body, is a finding of a laboratory's competence and capability to provide technically sound and appropriate measurement services within their scope of accreditation. Embedded in the process is an evaluation of the lab's ability to achieve and maintain traceability for the accredited services. Accreditation to ISO/IEC 17025  determines that a laboratory has all of the necessary facilities, equipment, standards, procedures, uncertainty analyses, personnel, etc., which make it capable of providing traceable measurement results. Laboratory accreditation does not speak to the specifics of any individual measurement result but to the overall capability of a lab to provide the service. NIST experts often participate in the accreditation process, but again, the end result is a finding of competence and capability only. I.D.1 Does NIST have publications that explain what traceability is and how to achieve it? Yes, NIST has a variety of publications. See references list in Section IV. I.D.2 What products and services does NIST provide in support of customers seeking to establish traceability? NIST provides a range of products and services in support of customers seeking to establish traceability of their measurement results. These include instrument calibrations, Standard Reference Materials (SRMs), and Standard Reference Data (SRD). NIST also provides measurement services to State and local governments responsible for marketplace transactions that involve measurements (weights and measures). NIST's Calibration Program, Standard Reference Materials Program, and the Weights and Measures Program make up the largest integrated national measurement transfer system in the world. The Standard Reference Data Program augments this system by providing scientists, engineers and the general public with access to critically evaluated data necessary to perform state-of-the-art research and development. Through these four programs, NIST disseminates expert metrology guidance and the measurement products and services developed in the NIST Laboratories to the industrial and scientific communities, federal agencies and state and local governments. Calibration laboratories and testing facilities may be accredited by NIST under the National Voluntary Laboratory Accreditation Program (NVLAP). The basic procedures and general accreditation requirements of NVLAP are described in Reference . A participating laboratory may voluntarily take steps to improve or assess its measurement process. NIST Laboratories also provide a range of training courses and workshops on measurement practices. Topics covered include precision thermometry, temperature measurement by radiation thermometry, laser measurements, gage block calibration, time and frequency fundamentals, dimensional metrology, pressure, etc. I.D.3 If I have an instrument or artifact calibrated at NIST, does that make my measurement results traceable to those of NIST? Merely having an instrument or artifact calibrated at NIST is not enough to make the measurement result traceable to reference standards developed and maintained by NIST. To establish traceability to such reference standards, there must be an unbroken chain of calibrations and each provided measurement must be accompanied by a statement of uncertainty. The measurement system by which values are transferred must be clearly understood and under control. The dates and details of each link in the chain must also be provided. I.D.4 If I purchase an SRM, does that make my measurement results traceable to NIST? The purchase of an SRM does not automatically make the customer's measurement results traceable to reference standards developed and maintained by NIST. NIST SRMs serve as one mechanism for achieving measurement compatibility based on accuracy, and are intended to be used as part of a measurement system or program. The guiding principle in issuing an SRM is that it is used for measurement quality assessment. A claim of traceability to reference standards developed and maintained by NIST can be asserted by proper use of appropriate SRMs and reference to the certified values and uncertainties provided by a NIST Certificate of Analysis. This Certificate contains a statement of the intended use of the SRM (NOTE: NIST cannot foresee all the uses for a specific SRM and recognizes that defensible assertions can be made for alternative use). In general, the Certificate also contains a disclaimer for improper handling of a material. It is up to the user to document appropriate storage and preservation of a material. An SRM certificate also contains an expiration date. It is inappropriate to use an expired material to establish a traceability claim. Finally, it is up to the user to demonstrate that the Certificate of Analysis in their possession is valid and up-to-date. I.D.5 If I purchase a NIST Traceable Reference Material (NTRM), does that make my measurement results traceable to those of NIST? As with SRMs, the purchase of an NTRM does not automatically make the customer's measurement results traceable to reference standards developed and maintained by NIST. However, NTRMs can be used to make a claim of traceability to NIST in the same manner as SRMs, with reference to the certified values and uncertainties on an NTRM Certificate of Analysis. I.D.6 NIST data are often used in claims of traceability to NIST. Under what conditions can one consider NIST data to be "specified references"? Standard Reference Data, that is, data that have been evaluated for validity by knowledgeable experts in the particular field with stated uncertainties. Measurements of properties that result from various NIST research programs, which may or may not have complete expressed uncertainty. Great effort is made to describe clearly the type of data in NIST electronic and printed data collections. Usually, data from NIST are accompanied by uncertainties that have been estimated and propagated according to the Evaluation of measurement data - Guide to the expression of uncertainty in measurement (GUM) . When data are evaluated, the scientific basis used in evaluating these data is well documented and the data labeled as NIST Standard Reference Data. The use of these data as "stated references" depends on the type of collection (Standard Reference Data, values of physical constants, etc. ), the date of the most recent evaluation or compilation, and the direct relevance of the data to the physical measurement for which traceability is needed. In particular, if the data are not part of a NIST compilation of evaluated data, then care should be taken to assess the expressed uncertainty, and the literature checked for additional values for comparison. I.D.7 Can organizations claim traceability to NIST by having individual instrument components calibrated at NIST? If so, is that the same as sending the entire instrument to NIST for calibration? If the claim of traceability to reference standards developed and maintained by NIST is supported by an appropriate measurement assurance process and uncertainty analysis, the claim may be valid. The measurement process and uncertainty analysis must show how the basic component measurements are combined and translated into a complete calibration for the instrument in question. Is it the same as sending the complete instrument in? Possibly, but only when the organization combines the results using exactly the same measurement model and methods that NIST would use in calibrating the entire instrument, which is ordinarily not the case. I.D.8 How should customers claim traceability to NIST if NIST needs to use two or more of its own standards to calibrate the customer instrument, standard, or artifact? NIST may use a number of internal standards to calibrate or validate its own measurement process or system. The measurement results with associated uncertainties form the traceability link(s). The customer should claim traceability to the NIST system comprising the individual standards and should indicate who combined the data using what algorithm. Uncertainties should be documented, calculated, and reported accordingly. I.D.9 Can customers claim traceability to NIST for measurement results associated with something that NIST cannot calibrate directly? Yes, under certain circumstances. If well-accepted, scientifically sound and appropriate measurement equipment, practices, and procedures are used; if measurement values and uncertainties are calculated or otherwise established according to well-established protocols; and if the uncertainties are within accepted norms (both low and high) for the measurement application; then the customer's measurement result might be considered traceable to NIST. As an example, there are many measurement quantities for which NIST does not offer calibration services, but that are derived from a combination of other measurement quantities for which NIST does provide calibration services. Torque is one example. NIST does not offer a calibration service for torque. It does, however, offer services for the component measurement quantities (mass, length, etc.) that are needed to derive torque, according to the well-accepted definition of torque. By performing the steps necessary to achieve traceability to NIST of the individual component measurement results when making a particular measurement of torque, it is possible to claim traceability of the corresponding measurement result to NIST. The uncertainty of the measurement result must first be calculated (again using a well-established methodology, such as that in NIST Technical Note 1297 ) using the uncertainties associated with the individual component measurement quantities. This uncertainty must be at (or above) a realistic level of uncertainty consistent with the sophistication of the measurement model and other practical and established considerations. As another example, NIST does provide calibration services for voltage, but only at discrete values of voltage. If an organization wants to establish traceability to NIST at other values of voltage, it must develop an interpolation or extrapolation mechanism and protocol for doing this. Additional measurement uncertainties will result. The resulting statement of traceability must incorporate these additional uncertainties, which must again be realistic and within expected norms. As a third example, NIST may not offer any calibration service or SRM for a particular measurement quantity, but may provide measurement protocols and advice, along with expected norms for levels of uncertainty that can be achieved according to the protocol. Under these circumstances, an organization may again claim traceability of its measurement results to NIST if the protocols (and built-in checks/tests) are followed, and the claimed uncertainties are within the expected norms. For more on the "Elements of Traceability" please see clause 4 of Reference  and Reference . I.E.1 What is the CIPM MRA and what does it have to do with traceability? The CIPM Mutual Recognition Arrangement (MRA) was drawn up by the International Committee of Weights and Measures (CIPM) under the authority given to it in the Metre Convention, for signature by directors of member National Metrology Institutes (NMIs). The principal objectives of the MRA are to establish through measurement comparisons the degree of equivalence of national measurement standards maintained by NMIs, to provide for the mutual recognition of calibration and measurement certificates issued by NMIs, and to provide a secure technical foundation for wider agreements related to international trade, commerce, and regulatory affairs. The mutual recognition of calibration and measurement certificates requires that each NMI participate in the activities of the International Bureau of Weights and Measures (BIPM) (including key measurement comparisons) and have a suitable way of assuring quality in the results of its measurement services. The results of the key measurement comparisons and specific statements of the calibration and measurement capabilities (CMCs) of each signatory NMI are entered in an MRA database originally developed by NIST and now maintained by the Bureau of International Weights and Measures at http://kcdb.bipm.org/. While NIST recognizes the validity of the other signatories' certificates, such recognition does not mean that measurement results traceable to any other signatory are therefore traceable to NIST. The burden of establishing traceability of its measurement results to NIST, and of supporting an associated claim of traceability, is on the individual NMI providing the service. I.E.2 If a laboratory establishes traceability of its measurement results to standards maintained by National Metrology Institutes (NMIs) that is a signatory to the CIPM MRA, does that mean that that laboratory's measurement results are traceable to standards maintained by other signatory NMIs? While signatory NMIs (including NIST) recognize the validity of other signatories' measurement and calibration certificates under the MRA, such recognition does not mean that measurement results obtained by one signatory NMI are automatically traceable to stated references developed and maintained by any other signatory NMI. However, users of measurement results, who may be either commercial or regulatory entities, may well decide that sufficient evidence exists under the MRA to provide mutually acceptable traceability of these results to the standards and measurements of two or more participating NMIs. Such evidence may include comparable claims of calibration and measurement capabilities of the NMIs for a particular measurement or calibration service, coupled with satisfactory performance on a key comparison of the same measurement or standard by each of the NMIs. I.E.3 What are laboratory accreditation MRAs and what do they have to do with traceability? I.E.4 Because NIST's National Voluntary Laboratory Accreditation Program (NVLAP) is a signatory to multiple MRAs with other accreditation bodies, does that mean NIST stands behind claims of traceability made by any laboratory accredited by any other MRA signatory? As previously stated, laboratory accreditation, whether conducted by NVLAP or any other recognized accreditation body, is a finding of a laboratory's competence and capability to provide technically sound and appropriate measurement services within their scope of accreditation. As a signatory to MRAs operated under the auspices of the Asia-Pacific Laboratory Accreditation Cooperation (APLAC) and the International Laboratory Accreditation Cooperation (ILAC), NVLAP promotes international acceptance of test, calibration and inspection reports and other documents issued by laboratories and inspection bodies accredited by signatories to the MRAs. All calibration and test reports must declare the source of traceability and it is the responsibility of the user to determine which source is suitable for its needs. NIST, in partnership with the Environmental Protection Agency (EPA) and 10 specialty gas companies established the NIST Traceable Reference Material (NTRM) Program for gas mixture standards as a means for providing end users with the large volumes of NIST-traceable gas mixture standards needed to implement the "Emissions Trading" provision of the 1990 Clean Air Act. In general, an NTRM is a reference material produced and distributed by a commercial supplier with a well-defined traceability linkage to NIST. This linkage is established via criteria and protocols defined by NIST that are tailored to meet the needs of the metrological community to be served. The production and value-assignment protocols required are based on NIST experience in the production and certification of its own gas mixture SRMs. The integrity of the NTRMs produced is assured by NIST through an active internal quality assurance program that includes NIST analysis of at least 10 % of each NTRM batch and NIST value-assignment of each batch based on NIST and client company measurements . Ion-implanted standards of known dose are needed to calibrate secondary ion responses for Secondary Ionization Mass Spectrometry (SIMS) in the semiconductor industry. SIMS is relied upon to measure the concentrations and depth profiles of key dopants in silicon, but SIMS measurement results are matrix dependent. A reference material is needed for each element and matrix combination and the comparability of SIMS results when calibrated with reference materials from different sources is not sufficient to meet the needs of the semiconductor community. An accuracy-based transfer standard from NIST enables the industry to transfer technology from one manufacturing site to another, compare experimental data with theoretical process models, and provide the basis for international comparability via ISO (International Organization for Standardization) standards. A NIST reference method for arsenic in silicon based on Neutron Activation Analysis was developed and critically evaluated. Twenty-nine sources of uncertainty were identified and quantified, of which seven accounted for 98 % of the total uncertainty. This reference technology was transferred to the semiconductor community through certification of SRM 2134, Ion-Implanted Arsenic in Silicon, which has an expanded uncertainty of 0.38 % . The 1999 International Technology Roadmap for Semiconductors (ITRS) calls for improvement in dopant profile concentration measurements from ± 5 % in 1999 to ± 2 % in 2008. These values are to be accomplished with "low systematic error" as well. SRM 2134 has met these requirements for arsenic since 2001.
proficiency tests and fixed-point materials, fixed-point cells, and thermometers as SRMs. An example of traceability to NIST temperature standards is the Measurement Assurance Program (MAP), as implemented with Standard Platinum Resistance Thermometers (SPRTs) in the range - 190° C to 660° C. In a MAP, NIST sends to a customer who realizes the ITS-90 or an approximation to the ITS-90 a set of three SPRTs that have previously been calibrated by NIST on the ITS-90. The customer calibrates the set of SPRTs and then returns the SPRTs to NIST for a final calibration. NIST analyzes the raw data, uncertainty statements, methods of data analysis, methods of realization of the ITS-90, calibration report results and format. A full descriptive report of this analysis is sent to the customer with suggestions for improvement and a quantitative statement of the present level of agreement of the customer calibrations with the NIST calibrations. A MAP is a quantitative test of the customer's ability to calibrate SPRTs and of the validity of the claimed uncertainties of the calibrations. When conducted at regular intervals, a MAP supports the customer's claim of continuous traceability to NIST at a specified uncertainty [13-14]. assuring metrological traceability - Here meaning to provide support for the claim of traceability of the result of a given measurement. certifying metrological traceability – Here meaning to formally attest that traceability exists in a given situation. defining metrological traceability – Here meaning to authoritatively state or set forth the (operational) meaning of the term "metrological traceability." internal measurement assurance program – program of sufficient complexity, within an organization, to provide credibility to the measurement uncertainty and measurement result for which traceability is to be established. An internal measurement assurance program usually involves monitoring the performance (e.g., stability, reproducibility) of the instrument, standard, or measurement system, before and after it is characterized, calibrated, or used to obtain the traceable measurement result. laboratory accreditation – procedure by which an authoritative body gives formal recognition that a laboratory is competent to carry out specific tasks. Accreditation does not itself qualify the laboratory to approve any particular product. However, accreditation may be relevant to approval and certification authorities when they decide whether or not to accept data produced by a given laboratory in connection with their own activities . measurement result – According to the VIM: set of quantity values being attributed to a measurand together with any other available relevant information, generally expressed as a single measured quantity value and a measurement uncertainty. The concept of traceability covers both measurement results of quantity values and of nominal property values such as chemical identity and sequence (Reference , definition 2.9). measurement uncertainty – Here meaning uncertainty of measurement that: (1) fulfills the VIM definition as the parameter, associated with the result of a measurement, that characterizes the dispersion of values that could reasonably be attributed to the measurand; (2) is evaluated and expressed according to the general rules given in the ISO Guide to the Expression of Uncertainty in Measurement (or other sound and accepted method); and (3) is explicitly set forth in supporting documentation. national or international standards – here meaning measurement standards. Standards (national) recognized by a national decision to serve, in a country, as the basis for assigning values to other standards of the quantity concerned; standards (international) recognized by an international agreement to serve internationally as the basis for assigning values to other standards of the quantity concerned . NIST Traceable Reference Material (NTRM) – a reference material produced by a commercial supplier with a well-defined traceability to NIST established via criteria and protocols defined and documented by NIST and tailored to meet the needs of the metrological community to be served . official NIST program or collaboration – Here meaning a NIST program or collaboration, officially approved by NIST management, in which NIST formally assures or certifies traceability of the results of measurements other than those that NIST itself provides. organizations that have authority and responsibility for variously defining, specifying, assuring, or certifying traceability – Here meaning any regulatory agency, standards developing organization, accreditation body, trade association or the like, which, by law or mutual agreement, is assigned or takes on authority and responsibility for some aspect of defining, specifying, assuring, or certifying traceability. proficiency evaluation materials – homogeneous material or artifact that is used to test and evaluate the measurement performance of different measuring systems for specific tasks. provider of the result of a measurement – The individual or organization that supplies for use the result of measurement for which metrological traceability is being asserted. reference material (RM) – Material, sufficiently homogeneous and stable with respect to one or more specified properties, which has been established to be fit for its intended use in a measurement process. RM is a generic term, and properties can be quantitative or qualitative, e.g., identity of substances or species . specified reference – Here taken to mean "specified reference measurement standard", where: (1) specified here means explicitly set forth in supporting documentation, and (2) a reference measurement standard, which, according to the VIM, is a measurement standard, generally having the highest metrological quality available at a given location or in a given organization, from which measurements there are derived. A national measurement standard is a standard recognized by a national authority to serve in a state or economy as the basis for assigning quantity or nominal property values to other standards of the quantity or kind concerned. An international measurement standard is a standard recognized by signatories to an international agreement and intended to serve worldwide. specifying metrological traceability – Here meaning to assert a requirement for traceability in a given situation. Standard Reference Data (SRD) – quantitative information, related to a measurable physical or chemical property of a substance or system of substances of known composition and structure, which is critically evaluated as to its reliability (Standard Reference Data Act, 15 U.S.C. 290 Sec. 2(a)). Standard Reference Material (SRM) – certified reference materials (CRMs) issued under the NIST trademark. NIST Standard Reference Materials are characterized using state-of-the-art measurement methods and/or technologies for the determination of chemical composition and/or physical properties. The property values of an SRM are certified by a process that establishes traceability to an accurate realization of the unit in which the property values are expressed or to a national standard defined de facto by a conventionally stated method. Each certified value is accompanied by an uncertainty at a stated level of confidence. SRMs are issued by NIST with a certificate that reports the results of the characterization and indicates the intended use of the material. test methods – logical sequence of operations, described generically, used in the performance of measurements  or specified technical procedures for performing a test . unbroken chain of calibrations – Here taken to mean the complete, explicitly described, and documented series of calibrations that successively link the value and uncertainty of a result of measurement with the values and uncertainties of each of the intermediate reference standards and the highest reference standard to which traceability for the result of measurement is claimed. A calibration is the operation that, under specified conditions, in a first step, establishes a relation between the quantity values with measurement uncertainties provided by measurement standards and corresponding indications with associated measurement uncertainties and, in a second step, uses this information to establish a relation for obtaining a measurement result from an indication. unbroken chain of comparisons – complete, explicitly described, and documented series of comparisons that successively link the value and uncertainty of the result of a measurement with the values and uncertainties of each of the intermediate reference standards and the highest reference standard to which traceability for the result of measurement is claimed. user of result – That is, the user of the result of a measurement; the individual or organization that receives for use the result of measurement for which metrological traceability is being asserted. JCGM 200:2008, International vocabulary of metrology - Basic and general concepts and associated terms (VIM Third Edition, 2008). C.D. Ehrlich and S.D. 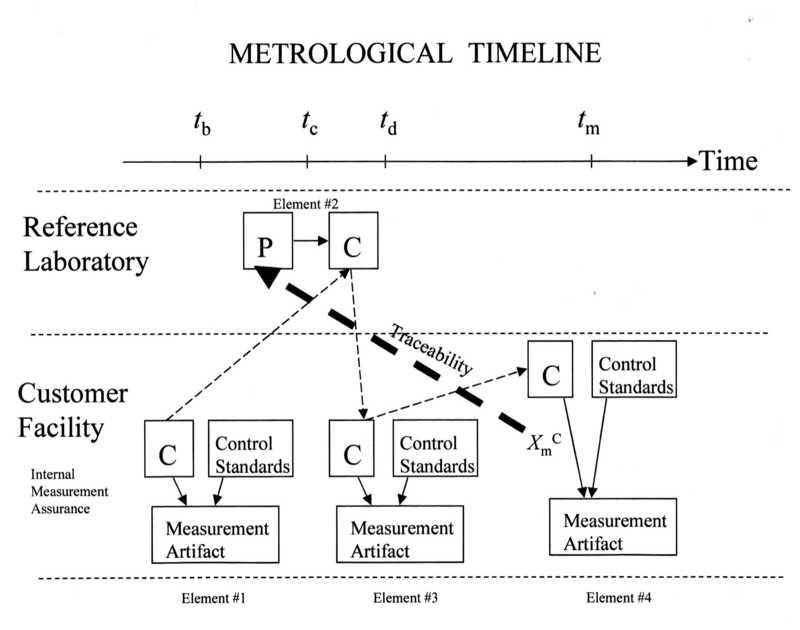 Rasberry, Metrological Timelines in Traceability, Journal of Research of the National Institute of Standards and Technology 103, 93 (1998). ISO/IEC 17025:2005 General requirements for the competence of testing and calibration laboratories (2005). NIST Handbook 150 National Voluntary Laboratory Accreditation Program: Procedures and General Requirements, C. D. Faison, J. Horlick, W. R. Merkel, and V. R. White, Editors, (February 2006). JCGM 100:2008 Evaluation of measurement data - Guide to the expression of uncertainty in measurement (GUM), BIPM, IEC, IFCC, ISO, IUPAC, IUPAP, OIML (2008). Taylor, B.N. ; Kuyatt, C.E. ; Guidelines for Evaluating and Expressing the Uncertainty of NIST Measurement Results; NIST Technical Note 1297, U.S. Government Printing Office: Washington DC (1994). ILAC G2:1994 Traceability of Measurements (1996). American National Standard for Dosimetry – Personnel Dosimetry Performance – Criteria for Testing, ANSI N13.11-2001. D.B. Golas, NIST Radiopharmaceutical Standard Reference Materials and the NEI/NIST Radiopharmaceutical Measurement Assurance Program, Applied Radiation and Isotopes 49, 329 (1998). American National Standard – Traceability of Radioactive Sources to the National Institute of Standards and Technology (NIST) and Associated Instrument Quality Control, ANSI N42.22-1995. Franklin R. Guenther, William D. Dorko, Walter R. Miller, and George C. Rhoderick, The NIST Traceable Reference Materials Program for Gas Standards, NIST Special Publication 260-126 (1996). R.R. Greenberg, R.M. Lindstrom, and D.S. Simons, Transferring the Accuracy of NIST Measurements to the Semiconductor Industry, J. Radioanalytical Nuclear Chemistry 245, 57 (2000). B.W. Mangum and G.T. Furukawa, Guidelines for Realizing the International Temperature Scale of 1990 (ITS-90), NIST Technical Note 1265 (1990). G.F. Strouse, NIST Measurement Assurance Program For The ITS-90, Test and Calibration Symposium, Arlington, VA, 1994. M.A. Lombardi, Traceability in Time and Frequency Metrology, Session 1B, NCSL International Conference, Charlotte, North Carolina (1999). ISO Guide 30:1992/Amd 1:2008: Terms and Definitions Used in Connection with Reference Materials (2008). ISO Guide 31: Reference Materials – Contents of Certificates and Labels (2000). ISO/IEC 17011:2004 Conformity assessment - General requirements for accreditation bodies accrediting conformity assessment bodies (2004). ISO/IEC Guide 2:2004 Standardization and related activities - General vocabulary (2004). To view documents which are "pdf files," Adobe Acrobat© Reader is required. This software may be downloaded without charge. The software is identified in order to assist users of this information service. In no case does such identification imply recommendation or endorsement by the National Institute of Standards and Technology.